Speaker Boehner's "Plan B" tax bill died today, just hours after FreedomWorks sent Congress a letter and launched a national call to action opposing the bill. When folks in Washington thought FreedomWorks was for the bill, they assumed it would pass. When FreedomWorks came out against the bill, it failed. Below is the blog post that Speaker Boehner reportedly cited when trying to persuade his fellow House Republicans to support the plan. It seems that he and others in Congress assumed FreedomWorks supported the bill. A close reading, however, reveals that while I warmly praised Mr. Boehner's decision to walk away from the negotiations with President Obama, and described the Boehner Plan B bill in factual terms, I never endorsed the bill, nor did FreedomWorks. Good news! Yesterday, House Speaker John Boehner announced he has pulled out of the bipartisan fiscal-cliff talks with President Obama and is moving toward the approach that FreedomWorks has been urging. Lock in the promised $1.2 trillion in ten-year sequester savings. Extend all current tax rates for one year (including the FICA payroll tax rate). Reform taxes and entitlements to avert another debt downgrade. Mr. Boehner's "Plan B" is to move a bill through the House that extends permanently (not just for a year) all current income-tax rates for everyone except those earning more than $1,000,000 a year. The bill includes some other tax provisions, listed below. Amendments are also likely to be made in order. [Note: It turned out no amendments were permitted, making it impossible for conservatives to improve the bill.] The votes could come as early as tomorrow [December 20]. While not nearly as good as the FreedomWorks Plan to avert the fiscal cliff, Plan B is much better than the so-called "balanced approach" that Mr. Boehner had, until Monday, been trying to negotiate with Mr. Obama. That deal would have: raised income tax rates for those in the two highest tax brackets; called off the promised sequester savings; cut Medicare benefits without real reform; and launched another round of wasteful and unnecessary stimulus spending. We need long-term spending reduction, but the Boehner-Obama plan as described in news reports would simply be another typical Washington "higher taxes today / lower spending someday, we promise" deal that wouldn't actually solve our long-term debt problem. Indeed, by cutting Medicare benefits without real reform, it would give the Left a convenient and powerful talking point in their efforts to stop real reform. Thank goodness that deal is off the table. Let's keep it off, by moving to Plan B -- and then amending Plan B into the FreedomWorks Plan. Plan B calls the Democrats' bluff. They've been loudly pressuring the Republican-controlled House to pass a bill to extend all current tax rates on households earning less than $250,000 a year. Yet now, with the Speaker publicly embracing their idea (although he would set the threshold at $1,000,000 a year instead of $250,000), the White House has issued a veto threat and Senate Majority Leader Harry Reid (D-NV) has blasted the bill as totally unaceptable. Apparently, the Democrats are willing to hold a middle-class tax cut hostage to their insistence on raising tax rates on people earning between $250,000 and $1,000,000 a year. The Plan B bill would prevent tax hikes for most income-tax payers in this weak economy. Let the Democrats explain their opposition to that. Given the Democrats' opposition, Plan B is unlikely to be signed into law. But in my opinion the House should consider it anyway (and, as I said, allow amendments, so we can turn it into the FreedomWorks plan). Does not include anything on the debt limit or other non-tax policy items. Remember, Speaker Boehner’s rule on the debt limit still applies: spending cuts must exceed any debt limit increase. Based on this description, I would say the bill can fairly be described as follows: a permanent middle-class tax cut that reduces taxes by $4,000,000,000,000 ($4 trillion) over ten years and does not violate the Americans for Tax Reform (ATR) "taxpayer protection" pledge (which most congressional Republicans have signed). According to House Republican aides, GOP leaders are planning to bring their “plan B” to the floor as soon as Thursday. Under that proposal, the House would vote on two amendments: One that would allow tax rates to go up on those making more than $250,000 — as Senate Democrats have called for — and one that would allow tax rates to go up on those making more than $1 million. The latter would also include extensions of the estate tax and a fix to make sure the alternative minimum tax does not hit middle-income taxpayers. These and additional amendments should definitely be allowed. Let House members vote on tax rates, including payroll tax rates. The sequester will kick in. It will reduce spending by an estimated $110 billion in 2013, and $1,200,000,000,000 ($1.2 trillion) over ten years. The Social Security portion of workers' payroll taxes (FICA) will rise by 30 percent. Certain expiring tax provisions (mostly of interest to corporate interests) will expire. Medicare's payments to physicians for medical services will go down by about 30 percent. Extended unemployment insurance benefits will no longer be extended and go back to their normal, 26-week length. Most of these "unaddressed" issues would presumably get dealt with during the next round of the Great Debt Ceiling Debate or as part of some bipartisan "grand bargain" bill, in the New Year. The current debt limit of $16,400,000,000,000 ($16.4 trillion) is projected to be reached in February of next year, at which time the president will have to ask Congress for another increase. Meanwhile, the 40 percent of the budget that is annually appropriated expires on April 1, 2013. So we should expect budget brinkmanship and bipartisan game-playing to continue right through the first quarter of 2013. 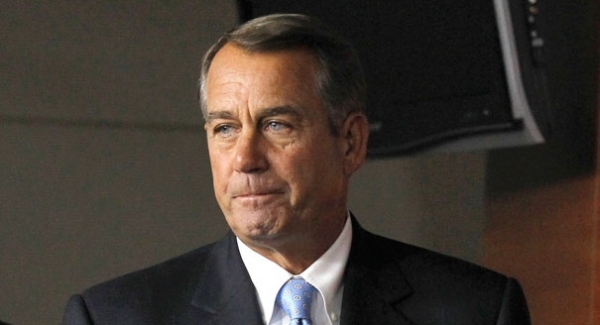 Speaker Boehner: Congratulations, you are moving in the right direction. You woke up and realized you have the power to say No to the Left. Stay the course. Go all the way to the FreedomWorks plan, and you'll have it made in the shade. P.S. From now on, sir, we in the grassroots freedom movement respectfully ask you to offset each new debt ceiling increase with an equivalent amount of spending reductions, in the same bill. No more "super committees." No more kicking the can down the road. The time to get serious on spending reductions is now. The Speaker's refusal to allow amendments to his bill, and the Democrats' insistence on holding out for more tax hikes, led FreedomWorks to conclude today that passing the bill at that point would only strengthen the Left's movement for higher taxes and therefore the bill should be opposed. A few hours before the scheduled vote, FreedomWorks issued a national call to action against the bill. When the time arrived to vote, the Speaker was forced to pull the bill from consideration, unable to secure ufficient support for it among his fellow Republicans, despite having taken the unusual step of publicly lobbying them in person. We believe FreedomWorks' opposition helped kill the bill, and that Mr. Boehner would probably have fared better if he had taken our advice and tried to extend ALL current tax rates. Republicans throw Americans off the cliff, blame it on Obama, then go home to celebrate the season of giving. Face it, Republicans don't give a damn about most American people, only American millionaires. They don't have to care because they have good salaries, paid holidays, comprehensive health care and a good retirement package, all paid for with American tax dollars, our tax dollars. Politicians, and large Corporations, are the biggest receivers of entitlements there are. When Obama said “You didn't build that”, he should have added “by yourself”. Every product ever made needed others to build it, service it and BUY IT. Corporate giants are so full of themselves that they bite their noses off to spite their faces and Politicians, whose only real desire is getting re-elected to the “Gravy Train”, buy the Corporate sob stories hook, line and sinker. Since they can't figure out a way to take away social services, (you know, those programs created with our tax dollars to help each other), from the people who pay for their salaries and benefits, they're just going to smile for the camera and go home. They don't care because we have taken care of them. They are despicable grinches and spit on every Christian value that Jesus ever taught. Merry Conservative Christmas America! Dean this is shameful. You make it sound as if Plan B had other substance other than the tax increase on earners over $1 million. Plan B's foundation is ONLY a tax hike on success and is a violation of Conservative principles. Shame on you for backing this egregious plan. Speaker Boehner's failed gambit reminds us that he tends to follow an unhappy pattern: Negotiate first with the Left, then, when they say No, try to force the Right to compromise. That gets it backwards. If Obama and Reid are screaming, that means Boehner is moving in the right direction. Statesmanship is the art of knowing when to tick off your own friends -- for their sake. Obama has already said that he won't let this pass, so what this Plan B does now is it forces him to make it abundantly clear that it's not just the very richest folks he wants to tax. Makes him look like the unreasonable one here (which he is, but the public doesn't seem to recognize this fact). Although it would be better if Boehner were standing more firmly on principle, this deal is a sign that he's moving much closer to our direction, which is a vast improvement from the concessions he was reportedly willing to make last week. In 2015, Congressman Mark Meadows (R-N.C.) started a movement to remove then-Speaker of the House, John Boehner (R-Ohio), from his position. Of this effort, Meadows said, "It's really more about trying to have a conversation on making this place work, where everybody's voice matters, where there's not a punitive culture. Hopefully, we'll have some discussion about that in the days and weeks to come." Congress created the Supplemental Nutrition Assistance Program (SNAP) to reduce food insecurity among impoverished Americans. At the same time, Congress recognized that welfare programs must foster self-sufficiency. The Trump administration is looking for innovative solutions that improve both goals.